Another year, another flurry of birthdays in our little family. Not only are the four of us in June/July but we have around 6 other family members celebrating birthdays in these months too!! Makes for a busy few months! 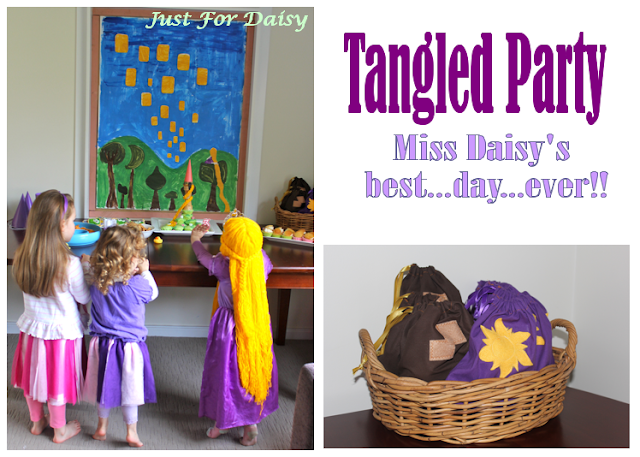 Miss Daisy started requesting a Tangled party quite early in the year... I'm not even sure where she got the idea that a party could have a theme, but she did. 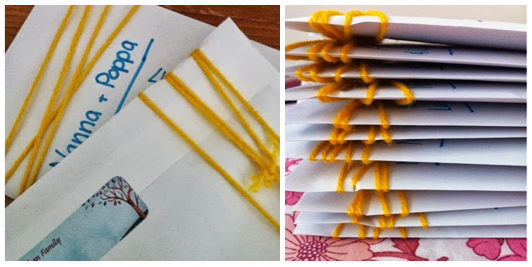 And so with great anticipation we planned it in our heads, on paper and with our crafting! 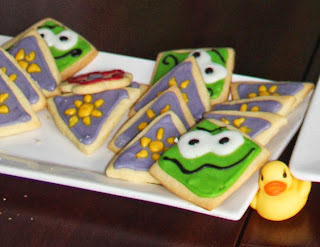 If you're planning a Tangled Party follow along with my Tangled party board on pinterest! 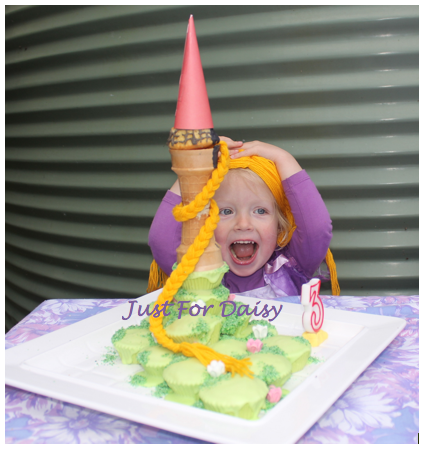 Here's a taste of Miss Daisy's Tangled Party - I think she made a pretty cute Rapunzel, don't you? She certainly had the best...day...ever!!! Here's Miss Daisy with her sweet cousins (3 of the 7 - they were all there!) before the party! Look at that hair!! Miss Daisy and I painted the Rapunzel painting in the background a few days before the party. This space was a window which we boarded up and are yet to paint, so this image still graces our lounge room with it's presence! Miss Daisy spotted a Rapunzel dress one night at Kmart.... I really wanted to make her a costume but thankfully I gave in and bought the overpriced, poorly made dress... because there's no way I would've made anything in time! And it looked great on the day! However, I couldn't resist making her a wig! 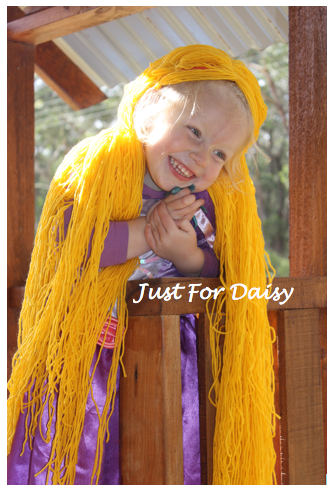 This gorgeous wig took 2 balls of wool ($4), some matching embroidery thread, a needle (expect sore fingers!) and I used an old cotton beanie (baby size) for the base of the wig. I used the great advice from this post to make the wig. Did you see the party bags at the top? Go back up - they're fabulous!! I planned and cut these but again my timing was WAY off... so my darling sister in law sewed them up the night before the party! Aren't they great! I really liked these satchels/bags and tried for a similar feel! We filled them with some homemade cookies, balloon, party blower, freddo and a small blank canvas for the children to paint at home! Having been making treats, iced cookies and cakes for the day... little did I know I was swiftly running low on baking supplies! 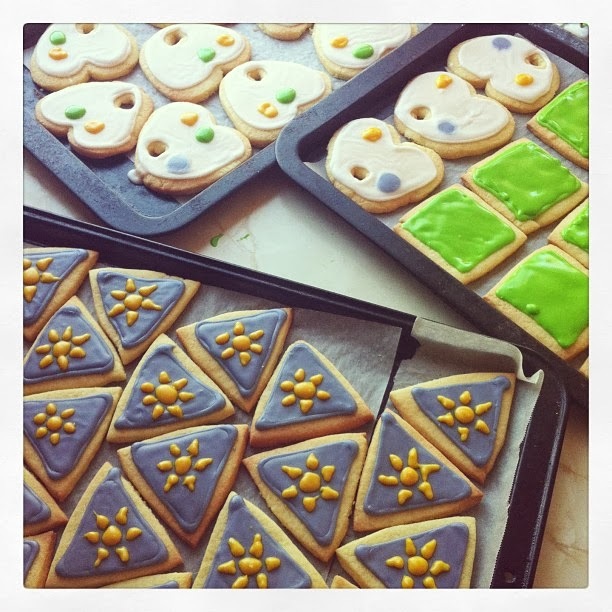 Icing sugar became a precious commodity! I'd planned to use fondant for the braid and for grass. 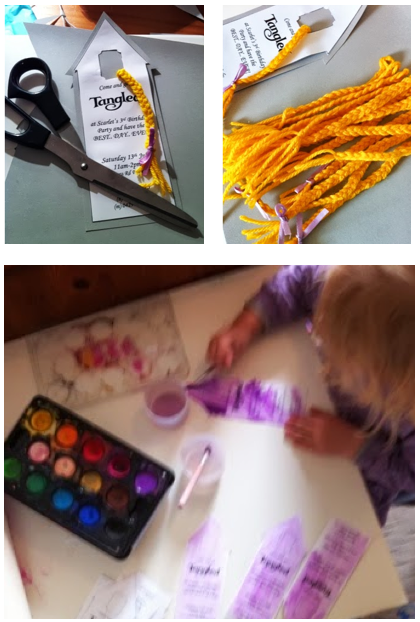 Anyway, the idea of using fondant icing was quickly overruled as it was too heavy for our ice cream cone tower, so I braided another lot of wool and used that for Rapunzel's hair. I'd bought some pre-made edible flowers and my SIL had the great idea to dye some coconut for the grass instead of icing... it worked GREAT! You can see her Rainbow Cake and her Peppa Pig cake from her last two birthdays... I'm not sure how many years I'll keep taking requests! For games: I made some cool fry pans out of black plastic bowls with metallic plastic knives glue gunned to them. 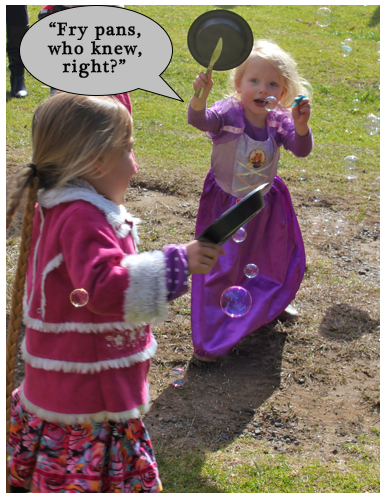 These were used for a throw Pascal in the pan game, using some squishy lizard toys from the $2 shop... followed by the children running around the yard trying to pop the bubbles from our bubble blowing machine with their fry pans! Fun! 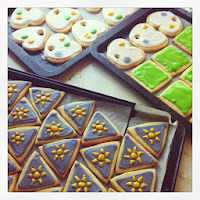 I used a triangle cutter for the sun bunting cookies, a square cutter for pascal and iced in a diamond shape, and the paint palletes were a love heart cutter that I trimmed the hard point to round it off and poked a hole through the dough before cooking to make it look like a palette! One of these days I'll write a post about my sugar cookies - I've loved doing them for both girls parties lately and for my sister's baby shower last year. All of them iced with only a zip lock bag! Yep, clever huh!? All up we had a really lovely day! 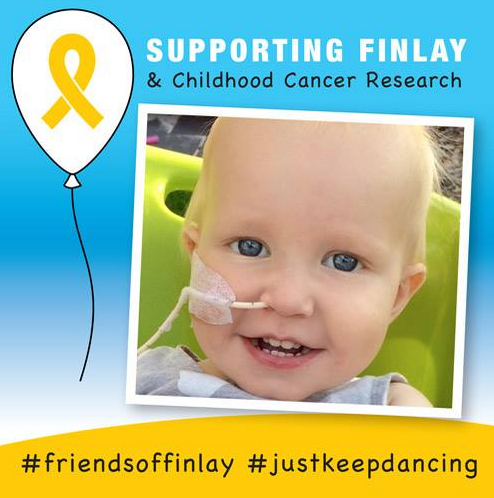 So great to have our friends and family join us to make this the best... day... ever for Miss Daisy! And to add to the amazing month of June/July my gorgeous online friend Jackie has a special girl with a birthday too! 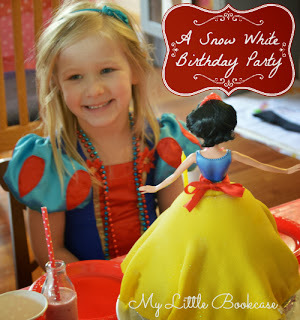 Check out their fabulous princess party - for a very sweet Snow White! This party is the goods - games, decorations, cake, you name it they've got it! Click the picture below to head over to My Little Bookcase for a peak into Snow White's Enchanted Forest Party.